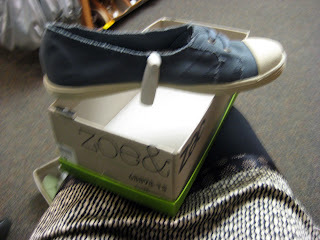 Payless on 34th Street finally has a granola rep in house, the new zoe&zac line. Organic materials, recycled rubber, cute styles for that sort of thing, and when you buy a pair one dollar is donated to The Nature Conservancy. Well done, Payless. V. adorable sneaker ($19.99) for summer dresses. 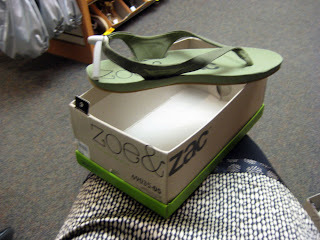 And like the simple sandal ($24.99) but the t-strap hurt. Although I think my feet are growing so it's not you z&z, it's me. Some new Abaete, ahoy to the Helm, $38. That is a 4 1/2 inch heel so start walking the plank, girls. I try this on every time I'm in store ($36). You know, shiny things a girl can't resist...go on sale glitter flat! Dexter polka dot bow flat, on sale for $16.99. New alice+olivia's for Payless, all $38. Where are the new Patricia Field's? No one better say she's no longer collaborating with Payless! Don't be ruining my post-Easter high. Only you could make me consider stopping in Payless. I'm going to snap up the last two. What a great deal. ooh! thank you SOO MUCH for the heads up. i have that last pair in my basket right now and also the a+o polka dotted high heels. they're monstrous! i think i'm gonna go back for the cheetah and those white wedged a+o's later. i need them! hah. Those basket-weave wedges are darling! Love those white heels, so summer! I shop Payless because most of their shoes are meatless. I wish they did more mid-height heels though. It seems like everything is either flat or 4.5 inches! la belette - what a great compliment, you are too sweet! prunella - GET THEM! the a+o's are usually pretty comfortable, too. miss yaya - see above! some are hit and miss, but the designer collabs are usually more comfortable. 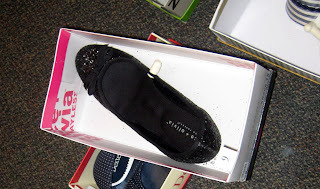 farren - i swear, I have to drop by often to keep on top of payless! they are so on with their designer collabs. sal - right? even cuter in person. kira - hopefully you can come visit again soon! i have to go check out your nyc pics. wire monkey - the contemporary shoe dilemma! try the lela roses, they are generally more office/day wearable. the abaete helms are really cute but those heels are really high. Love the way you describe this Miss Fashion - you are too funny! That stars dress is serious. I wouldn't want a roundhouse kick to the face while you're wearing that bad boy.